The mechanical movement for this clock was made for Crosby Steam Gauge and Valve Company and shipped from our factory on January 27, 1911. Clock is marked with serial number 69045. 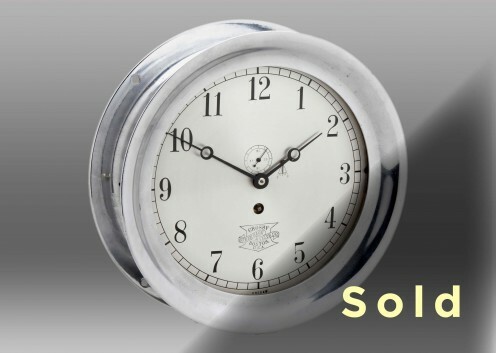 8 1/2" Crosby Steam Gage Clock, Chrome Case, Hinged Bezel, Silvered 12 Hour Dial marked with "Crosby Steam Gage and Valve Co." The dial features an offset remote sweep hand.